In an effort to share my thoughts, insights ,and ideas surrounding modern product design with others, and, more importantly, to help myself stay informed and receptive of modern design trend, I will be writing a series of pieces on this very topic. It is my hope that Murphy’s Hypotenusewill supplement and expand the breadth of insightful content that Trig's Tangents is all about, while exploring the trends, uniqueness, and in some cases, horrors, of today's product design landscape. Enjoy—Patrick Murphy, Industrial Designer, Trig Innovation. I love facets. 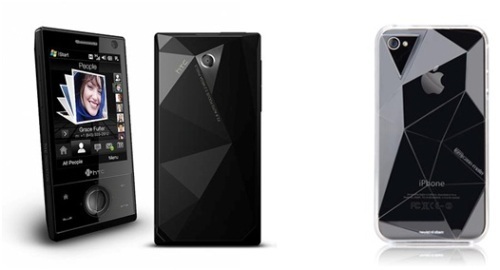 Specifically, I love the use of facets and randomized faceted geometries in product design. Maybe I love facets the way I do because I got so sick of the amorphous, blobby, bright-colored approach to product design that most products were slapped with during a period that coincided with the dotcom boom (a period that also suffered, in parallel, a horrific onslaught of company logos of the same character). I often lovingly refer to this time as the Karim Rashid Era of Design. Not to knock one of the greatest designers of all time, but, for whatever reason, by the middle of this past decade, I began to look towards angular forms as a means of aesthetic redemption for the sins that the fillet tool had wrought on design for the past 10 years. And facets, to me, represent a pinnacle of angular geometry. Facets have a unique footprint in the world of design. Their use has never become a big, long-lasting trend, nor has it ever been a flash in the pan. It seems that smart designers have brought facets into the spotlight at different, random times in the history of design. In the hands of a skilled designer, the facet can be a powerful tool for creating a product with elegance, edginess, and distinction. Over the years, some of these products have been successes, and some have failed; however, all of them are hard to miss in a sea of their peers. And just one of them would change the face of a company forever. Mobile handset maker HTC’s 2008 release of the Touch Diamond thrust the facet into the upper echelon of tech design trendiness. It’s the mobile phone version of the mullet, in a sense—business in the front, party in the back—as the entire back surface of the phone is faceted, ever-so-slightly. It’s hardly noticeable upon first glance, but when it catches a little bit of light, the effect is mesmerizing. We haven’t seen facets on a mobile handset design since 2008, but this no doubt coincides with the fact that evolving functionality and processing prowess in mobile phones is dictating that designers utilize less flair in expressing aesthetic attributes. This functional revolution has focused more emphasis on the design of the interface itself, rather than the shell. Facets made a tiny comeback in the world of mobile electronics in 2010, when Nike’s rock-star designer Eric Arlen released a series of mobile phone case designs for CaseMate, one of which was a dead ringer for the Touch Diamond. Although not very well known here in the United States, German designer Konstantin Grcic has been rocking Europe with innovative furniture for decades. Grcic blends an unmistakably German taste for precision and technique with intuition and refined simplicity influenced by his time at the Royal College of Art in London. Chair One is among his most well-known creations. The unique perch utilizes facets folded into each other to form a surprisingly comfortable cradle. Sitting in one of these was a highlight of a post-collegiate adventure of mine to Grcic’s hometown of Munich. 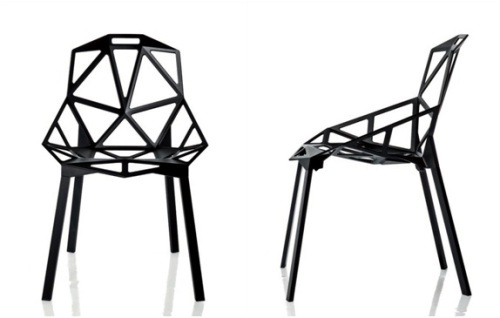 The 2004 design has evolved into a full line of seating solutions, and the faceted language employed in Chair One’s design has found its way into many of Grcic’s subsequent designs. At the beginning of the new millennium, car manufacturer Cadillac began releasing new models with a design language that departed from the aesthetic that had defined the company in decades past. Going back half a century, Cadillac was the very definition of automotive luxury and class, and this definition was founded on big-bodied cars, heavy as tanks, with plush interiors and an upright, mounted head badge that looked like a royal jewel. Thus, Cadillac became a great status symbol for the upper middle class. But when Cadillac hit the mid-70s and the energy crisis, the brand quickly became synonymous with antiquated thinking. The public abandoned these large, heavy cars in favor of more fuel efficient imports from Japan. Going forward, the stubbornness to update body styles that still looked at home in the 60’s reduced the brand from a symbol of class and sophistication to a symbol of senility and tastelessness. Enter the facet. In 1999, design duo Wayne Cherry and Kip Wasenko made waves at the Detroit Auto Show with their concept vehicle EVOQ. EVOQ was the purest expression of Cadillac’s new design philosophy “art and science,” whose implementation in production vehicles the company hoped would carry them into 21st century (they’d obviously missed the memo for a good 20-25 years or so at this point). Finally, 2002 saw the release of the Cadillac CTS, a replacement for the mundane Catera. With the advent of the CTS, the ambiguous and amorphous design language of a company struggling to catch up with the design of its competition was out, and something radically different—art and science—was in. Cadillac reclaimed its greatness not by copying the streamlined and rounded forms that dominated sedan design at the time, but by using angles and facets—and lots of them. The CTS looked as if it had been cut and polished from a rough precious stone, chips flecked off its face, hood, and backside until a sporty, forward-stance form emerged. The impact of Cadillac’s fresh take on the design of its vehicles was immediately felt. Sales skyrocketed. Cadillac was finally tapping younger demographics that were previously off-limits to the company. Cadillac had a game changer- a luxury sedan with the attitude of a sports car and an aesthetic that satisfies fans of Transformers and Wall-Street Suits alike. There was simply nothing else like it. After a record year capped off by winning a nomination for North American Car of the Year, the CTS and its faceted design eventually found its way into every single model in the Cadillac lineup. Today, you practically can’t take a drive without seeing a CTS, and the design trend it started almost 10 years ago has been pushed and refined along with each new model year to form the striking image Cadillac holds today.